Codie Small holds a cod that will be auctioned off Thursday at the Portland Fish Exchange. The Gulf of Maine's cod stock has continued to decline despite tough fishing quotas. 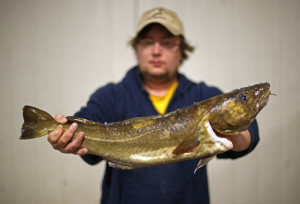 A cod that will be auctioned off is held by Codie Small at the Portland Fish Exchange on Thursday in Portland.